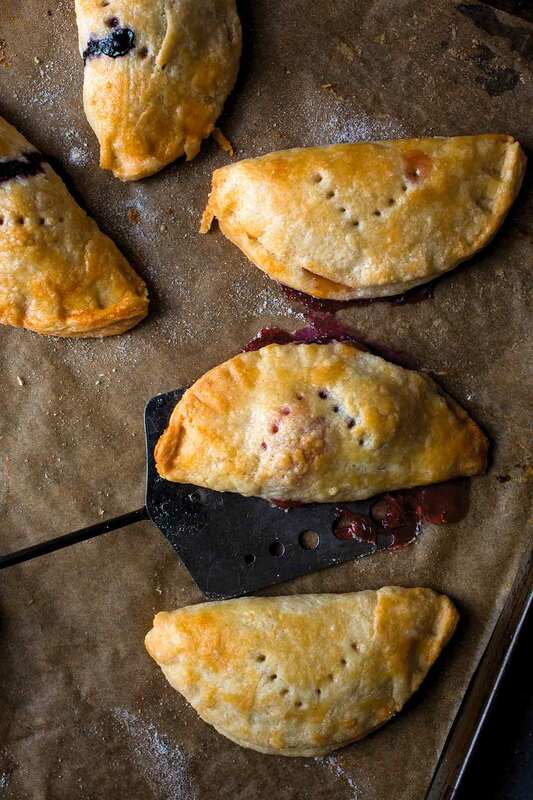 These hand pies are easy to make and even easier to customize to your cravings by swapping in whatever you want for the filling. Apple. Peach. Cherry. Chocolate. Nutella. Surprise us. Surprise yourself. There’s not really any rules or regulartions or restrictions on what you can use as filling for these easy hand pies. Follow your whim or your pantry. 1. On a sheet of parchment paper or a well-floured surface, roll the dough out to somewhere between 1/8- and 1/4-inch (3- and 6-mm) thickness. 3. Working with 1 portion of dough at a time, place a scant teaspoon or so of your desired filling on half the dough. (If your dough is larger or smaller than 3 inches, you’ll need to use more or less filling accordingly.) Dip your fingertip in water and lightly wet the edge of the dough with a tiny bit of water. Fold the uncovered dough over the filling and press firmly to make a seal. Repeat with the remaining dough and filling. Use a fork or knife to poke a little vent on top of each pie. 5. Preheat the oven to 400°F (205°C).Lightly brush the hand pies with the egg white mixed with the water and sprinkle with a bit of sugar. Bake the hand pies until golden, 10 to 17 minutes, depending on the size of your hand pies. Let them cool slightly. Revel in them while they’re still warm. For a savory version of these hand pies, use a spoonful of sturdy greens (such as kale or Swissh chard) that you’ve sautéed in olive oil with some garlic until wilted and tender. Then press the mixture with paper towels to remove any excess moisture. Mix with feta or blue cheese. Omit the sprinkle of sugar. These hand pies had just the right ratio of filling to crust and we loved every buttery, flaky, sweet bite. Bonus: You can use basically anything you want to fill these tiny pies, so the possibilities are endless. I used random bits of nearly everything sweet that I had on hand, including bittersweet chocolate, homemade pumpkin jam, homemade peach jam, and fresh blackberries (cut in half to fit more easily). I liked having a variety and they were all excellent for different reasons. My favorite was a tiny schmear of peach jam with half a blackberry. Delicious. Just be sure to seal these hand pies as well as you can to lessen the risk of losing any precious filling. I used the suggested pate brisee recipe and it turned out great (though my method was different since I sadly do not have a stand mixer). We really LOVED these hand pies. I used one half of a double-crust,all-butter pie crust from The Art of The Pie. I made 10 cute, delicious, miniature hand pies filled with a BRILLIANT and simple lemon curd (recipe also found in The Art of The Pie) and a single raspberry. The recipe suggests that less is more and trust me, you need VERY little filling. I might even suggest first filling just one hand pie and popping it in the oven for the allotted time to see how it goes and then adjusting your amount of filling accordingly. These little treats are not only tasty but a ton of fun in a tiny package. 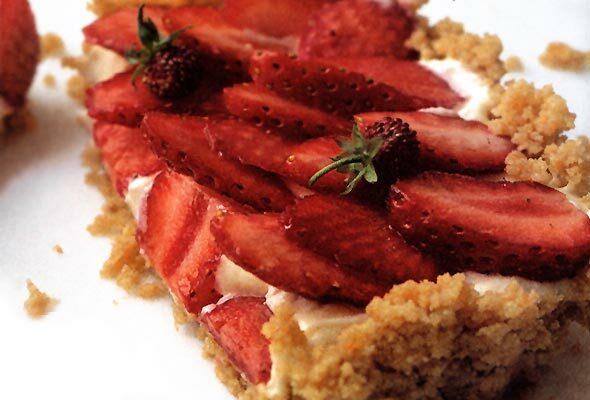 It would be perfect to make 30 or 40 with several different fillings to take to a party or picnic. Take a bunch to the office or your neighbors. These pies are easy to make and STUNNINGLY portable! To me, hand pies are a quicker and more rustic version of normal pie. For the fillings, I think the baker should get creative and put their favorite fruits or spices in. I put no more than two teaspoons of filling in each hand pie. I used candied pecans with pumpkin spice sprinkled over; some chocolate pieces from a baking bar that I put in a resealable plastic bag and smashed with a rolling pin; and homemade strawberry jam (I heated 10 whole strawberries with 2 teaspoons granulated sugar until the strawberries were soft enough to mash down with a fork). I baked the pies until they were slightly golden brown and I could tell some fillings were sizzling and done baking, which took 12 minutes. I would be interested to try the recommended savory options of greens and garlic but my sweet tooth prevailed this time! I stored the hand pies in a resealable plastic container in the fridge and warmed up each hand pie for about 30 seconds but they tasted best right out of the oven. Hand Pies Recipe © 2016 Kate McDermott. Photo © 2016 Andrew Scrivani. All rights reserved. All recipes and photos used with permission of the publisher. 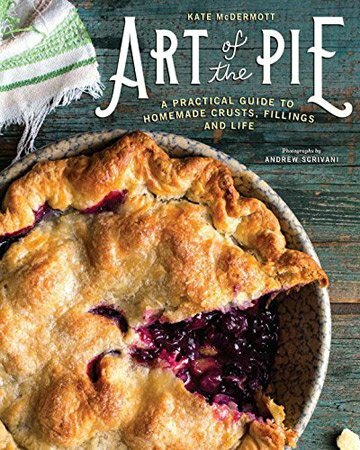 I am pleased as punch that you are sharing hand pies from ART OF THE PIE! The variety is limitless with this. So fun and so easy! We are infatuated with your book and the recipes found within, Kate. Thanks so much for sharing your talent with us, with our readers, and with the world! I actually used a pierogi press the last time I made handpies—which was awesome! I will try these—great filling ideas! Brilliant! Love the pierogi press trick! Many thanks for sharing and so glad you like the filling inspirations!